Since some time I barely use Firefox for surfing on the internet. Mostly I take Google Chrome. 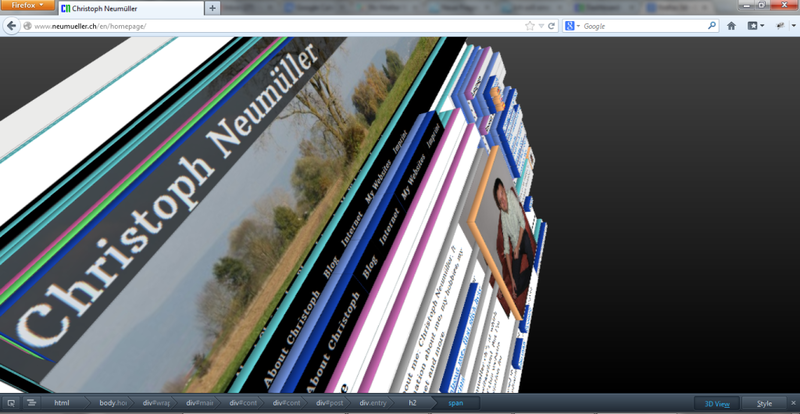 But from time to time I take a look at Firefox and today I have discovered one interesting feature of Firefox: You can see webpages in 3D! Although I’m no fan of the 3D-trend in cinema, I think this is a quite interesting and felicitous feature. The question is only: Do we really need it? How does Firefox look in 3D and how can I start the 3D-mode? The starting of the 3D-mode is really simple: You only have to make a right-click on an arbitrary area of the page and then press the Q-key on your keyboard. After that the developer-mode is started and you are able to select the 3D-view in the black bar on the bottom of the page. Then you can zoom and discover the page on your own by simply using your mouse. By the way: As you can see in this video, this feature has been already introduced in March 2012. This entry was posted in From the internet and tagged Internet. Bookmark the permalink.